This is by far my best idea; I have written it up in a working paper at my academia.edu and vixra, and named it: Quantum Mechanics, Information and Knowledge, all Aspects of Fractal Geometry and Revealed in an Understanding of Marginal Economics. I shall post the Abstract, followed by the original post, followed by the paper. I hope to have some collaborate and review my work in time. Fractal geometry is found universally and is said to be one of the best descriptions of our reality – from clouds and trees, to market price behaviour. As a fractal structure emerges – the repeating of a simple rule – it appears to share direct properties familiar to classical economics, including production, consumption, and equilibrium. This paper was an investigation into whether the mathematical principles behind ‘the market’ – known as marginalism – is an aspect or manifestation of a fractal geometry or attractor. Total and marginal areas (assumed to stand for utility) and the cost of production were graphed as the fractal grew and compared to a classical interpretation of diminishing marginal utility theory, and the market supply and demand. PED and PES was also calculated and analysed with respect to (iteration) time and decay. It was found the fractal attractor demonstrates properties and best models classical economic theory and from this it was deduced the market is a fractal attractor phenomenon where all properties are inextricably linked. The fractal, at equilibrium, appears to be a convergent – zeta function – series, able to be described by Fourier analysis, and involves Pi, i, e, 0, and 1 (of Euler’s identity) in one model. It also demonstrated growth, development, evolution and Say’s Law – production before consumption. Insights from the fractal on knowledge and knowing are also revealed, with implications on the question of what exactly is ‘science’ – and what is ‘art’? A connect between reality and quantum mechanics was identified. It was concluded marginal, classical economics is an aspect of a fractal geometry. For some time now I have pondered on the fractal, particularly the development the Koch Snowflake fractal, (seen below), I have noticed how it uncannily demonstrates many of the key features of economic theory. Could it be that the economy - as we experience it - is a fractal? Is it that the fractal can be understood as an economy? I am now confident, after doing the following analysis of the (Koch Snowflake) fractal that fractal geometry is the foundation of neoclassical economics and our reality. 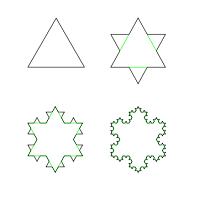 To show that the fractal demonstrates marginal utility (or benefit) I substituted area for utility, and then analysed the change in area over the development of the Koch Snowflake fractal - from a triangle (iteration 1 below), to the complete shape of the snowflake at iteration 4 (below). Shape is usually forms at and around 7 plus or minus 2 iterations: it is at iteration 4 (below) because of its size and relative thickness of line. 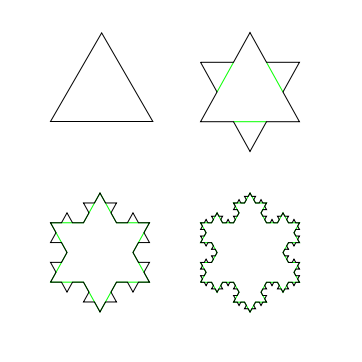 Once a rule - in this case new triangles - is set in action, and allowed to iterate (repeat) step by step, it will go on to eventually form a snowflake. After iteration 4, the shape will set at what I term fractal equilibrium: no more iterations will change the shape after this iteration - assuming a static viewers perspective, ie no zooming. If one were to continue the iterations beyond the point of fractal equilibrium (iteration 4 in the figure above and iteration 6 in the animation above) the computer generating the pattern would soon crash: the effort (cost) would multiply while the extra benefit to the viewer - in terms of the shape – would fall close to, but never equaling, zero. Take the time to look at this webpage http://mathforum.org/mathimages/index.php/Koch_Curve where you can experience the fill working of the Koch Curve first hand. 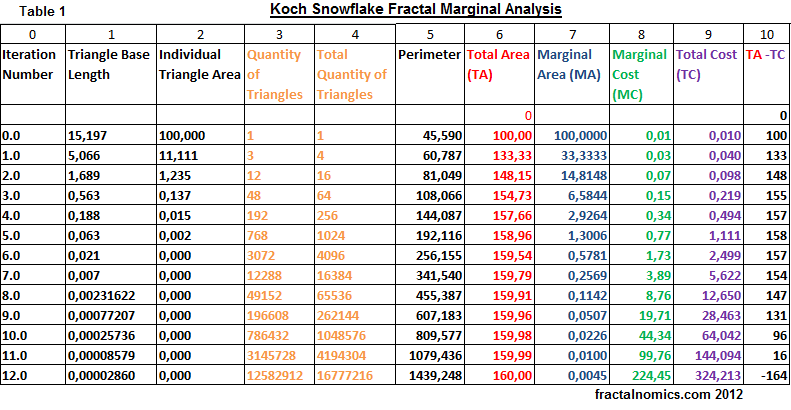 I analysed the growth of the Koch Snowflake using marginal analysis (a method found in any basic economic textbook) which looks at (in this case) the extra 'area' added - iteration by iteration. Fig 1. shows the total area (TA) and marginal area (MA) at each iteration. Notice, from the start, that Fig.1 resembles any marginal utility diagram found in any elementary economic text books. Fig 1. is derived from the fractal - not from any (fictitious) made up numbers, as in text books. All fractals - whether computer generated or not - will chart as Fig 1. Figure 4-1 above shows how the fractal analysis is similar if not the same as a typical economics text book diagram: marginal utility reference. The MA curve is a 'Power law' function, and that it demonstrates Pareto distribution - the 80/20 rule. 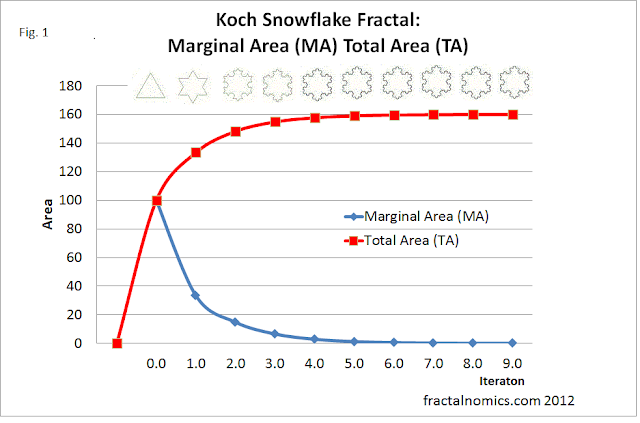 As the total area of the Koch Snowflake increases, after each iteration, the marginal or extra area (also) diminishes. The fractal is the perfect demonstration of diminishing marginal utility; it could be interpreted that diminishing marginal utility is a perfect demonstration of the (universal) fractal - that both are the same thing? My fractal-marginal analysis diagram is a snap-shot, taken somewhere (anywhere) in the set: this insight in turn has opened a window of enormous insight into reality, and has led me to the world quantum mechanics. The fractal (above) shows no scale - the numbers assigned are purely arbitrary and serve merely to show the relationship between the total area, 160, and the first triangle area 100. In fact triangles range in size from small, (but never reaching 0), to the infinitely large. From this early insight (in this blog) I have gone on to unlock the quantum features of the fractal and have recently suggested a direct link between the demand curve and the de Broglie wave function. Next: Marginal cost, Fractal production. I'm doing the International Baccalaureate course for my senior years, and I came across this for my Maths Exploration. This is actually very interesting, thanks for the inspiration!